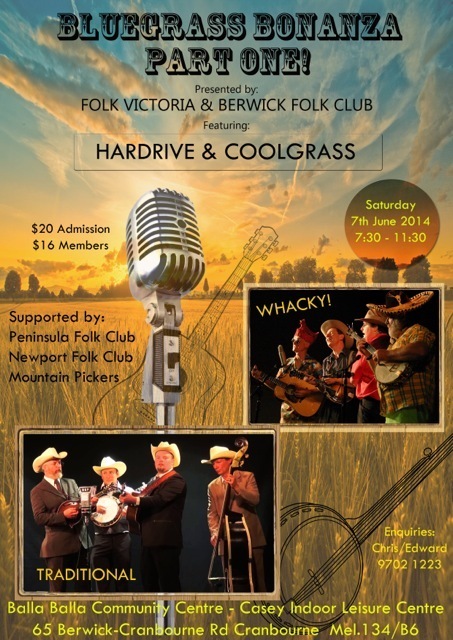 Folk Victoria and Berwick Folk Club have let us know of their plans to co-host a ‘Bluegrass Bonanza’ night in Cranbourne on Sat 7th June. The artist line up includes Hardrive and Coolgrass with local clubs including Mountain Pickers Association, Peninsula Folk Club and Selby Folk Club providing additional bands for the evening. The venue is Balla Balla Community Centre, 65 Berwick Cranbourne Road Cranbourne in Victoria. Click on the poster to the right for more details. Folk Victoria has been pretty dormant for the last few years. The new and invigorated committee is trying to get things moving again by building up a membership base and supporting live music.